Leesa vs Tuft and Needle: Which One Is Best For You? When it comes to purchasing a new mattress, sorting through all of the information available online can take a lot of time and effort. But don’t worry, we did it for you! This article conducts a head to head comparison of Leesa vs Tuft and Needle mattresses so you can easily see what makes them unique, and what makes them similar. Both mattresses are a blend of different high-quality durable foams. Interestingly, this similarity is also the source of most of their differences. This is because Leesa and Tuft & Needle have each patented a unique foam for use in their products. Let’s have a look! As a way to compare the Tuft and Needle vs Leesa we chose several traits to examine: the materials used in construction, the recommended sleep position, support or firmness and bounce, pressure point relief and contouring capability, edge support, airflow and temperature regulation, isolation of motion transfer, and affordability. After exploring our findings you will be able to make an informed decision about which mattress best suits your individual needs. The Leesa mattress is comprised of 3 layers and a cover. The top layer is 2” thick and made out of cooling LSA200 Foam. There’s a middle layer which is also 2” thick and is made out of contouring memory foam. The base layer is 6” thick and made out of a supportive Dense Core Foam. Lastly, the cover is made from a blend of breathable polyester fabrics. The T & N mattress is comprised of 2 layers and a cover. Firstly, the top layer is 3” thick and made out of Adaptive polyfoam. This layer is infused with cooling gel and heat wicking graphite. The base layer is 7” thick and made out of dense and supportive polyurethane foam. Finally, the cover is made from a blend of micro polyamide and breathable polyester materials. To determine a winner in this category it really depends on your personal preference. They both have very similar components but Leesa wins if you prefer a contouring sensation, and the T&N wins if you prioritize cooling potential and breathability. The Leesa mattress is specifically designed to accommodate you in any sleep position. It is supportive enough to promote healthy spinal alignment if you sleep on your back or stomach. The bed is also contouring enough to prevent pain caused by sleeping on your side. The Leesa is versatile and adapts to all sleep positions. If you are like me and you don’t have a preferred sleeping position, instead sleeping in every position every night, this one is a great option. It also a great option for couples who sleep in different positions. The Tuft & Needle mattress is designed to be comfortable and supportive for you regardless of what position you sleep in. It is supportive enough to accommodate sleeping on your stomach or back without any discomfort. Many find it is also soft and contouring enough to allow them to sleep on their side for extended periods of time. However, a small portion of people finds it is too firm for them if they sleep on their side. Leesa wins this round because of its universally appealing comfort level in all sleep positions. As mentioned, most people also find the T & N mattress is suitable for all sleep positions but there’s no hint of contention with the Leesa mattress, making it the clear winner. As we just mentioned, the level of support and fitness you need largely depends on what position you sleep in. This section provides a more in-depth look into the mattresses regarding these aspects to help better explain how they are different from one another. Aside from your sleeping position, the level of support and bounce a mattress provides is determined by your individual preference for the bed’s overall feel. You should also consider body size and weight. If you are a large or heavy person a bed with a lot of support and a medium-firm feel is recommended. On a scale of 1 to 10, with 10 being the firmest, Leesa ranks a 6. It offers medium to medium-firm support while simultaneously feeling soft as you apply pressure. The layer of 6” Dense Foam that serves as the base provides ample support for all body types and all sleep positions. If you are looking for bounce, this mattress does not provide much. 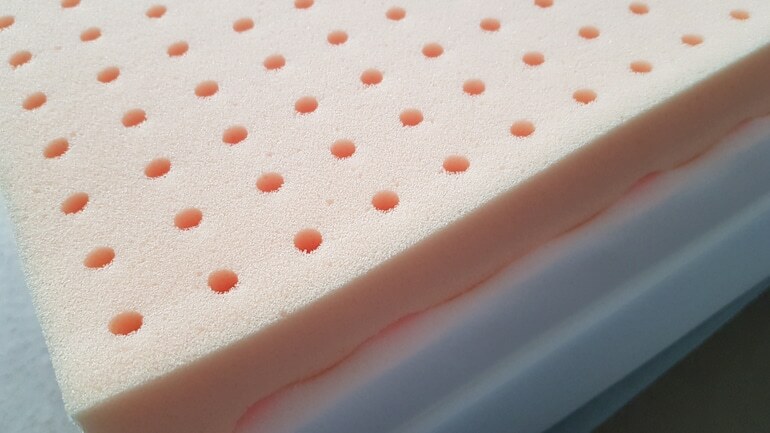 The layer of LSA200 foam on the top is bouncier than traditional memory foam but a contouring sensation is more commonly associated with the Leesa mattress. On a scale of 1 to 10, with 10 being the firmest, Tuft & Needle mattress ranks a 6.5-7. It offers medium-firm support while still allowing contour and responsiveness. The 7” layer of dense polyfoam that forms the base provides excellent support. The website claims their mattress is ideal for sleepers of weight or size. The polyfoam used to build this mattress is a bit bouncier than a traditional memory foam. If you prefer a mattress that bounces back to its original shape quickly, this may be the bed for you. It should be noted though, it is still not as bouncy as an innerspring mattress. The Leesa mattress also wins this round because of its slightly more universal appeal. It is a bit less firm while still providing ample support and comfort for all body types and positions. However, if you prioritize bounce or are a heavier person, the T&N mattress could be the winner for you. To help promote healthy spinal alignment and a restful night of sleep, both of these mattresses focus on targeted pressure point relief and a contouring sensation. If you sleep on your side pressure point relief should be a priority for you when considering which to buy. Without ample pressure point relief too much pressure will be put on your hip and shoulder while you sleep. A softer mattress can also help with this but sometimes they do not provide the right amount of support. Heavier people also benefit from this as it helps evenly distribute their weight across the bed. Athletic people also benefit from contour and pressure point relief because it allows their sore and strained muscles to relax and heal quickly while they sleep. Leesa has aptly named their 2” thick middle layer of memory foam the Recovery Layer. Memory foam was invented by NASA in the mid 20th century for use in aircraft seat cushions. They needed a material that could not only contour to the shape of the person applying pressure but could also provide enough pressure point relief to ensure safety under extreme force and pressure. After its invention and after it became more affordable, other industries, like the mattress industry, noticed how incredibly effective and durable it was and started using in their products. 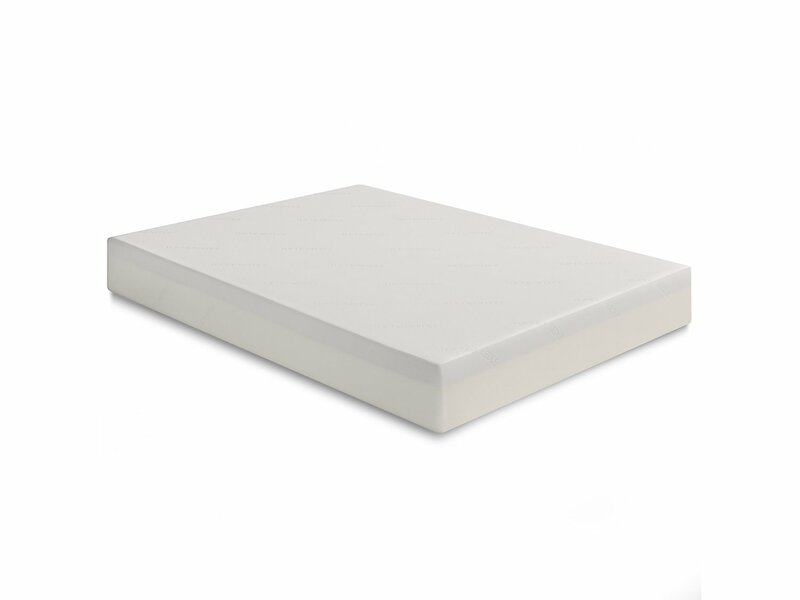 Leesa’s top layer of LSA200 foam also contributes to the overall contouring sensation provided by the mattress. This combination of materials does a superior job of providing accurately targeted pressure point relief exactly where you need while still contouring and feeling soft against your body. The top layer of Adaptive Foam is designed with targeted pressure point relief and contour potential in mind. On their website, Tuft & Needle discusses the benefits of their proprietary foam regarding contour and targeted pressure point relief and how considering these things led them to develop a new option. Their foam is superior to latex mattresses in this category. Due to the bounce provided by the material, some find they do not experience as much of a contouring sensation as they would like. Leesa wins this category as well! Its dual layer construction dedicated to targeted pressure point relief and contour makes it superior to the Tuft & Needle. While it does offer these characteristics as well, its increased bounciness detracts from the contouring sensation. When we compare the two mattresses head to head, Leesa wins. Edge support in a mattress is particularly important for couples, particularly if one or both of them sleeps on their stomach and needs a bit more space, and also for heavier people. With the right edge support, you can increase the usable surface area of the mattress and comfortably sit or lie close to the perimeter. Without enough edge support, a mattress will compress significantly and cause you to slip off the bed if you try sitting or lying near the edge. This limits the usable space of the mattress and makes it feel smaller than it truly is. Traditional foam mattresses are not known for excelling in this category, especially compared to innerspring variants, but let’s see who wins when it comes to Leesa vs Tuft and Needle. The edge support on the Leesa mattress is not bad compared to other foam mattresses. It is not one of the categories where it excels but it is fair overall. The mattress allows you to sit and lie near the edge without sliding off but some visible compression can be observed. No extra measures are taken to improve edge support in the Leesa bed, however, their newer model, Sapira, does. It is a hybrid innerspring and foam mattress. If you prioritize edge support in your mattress it is worth considering the Sapira over the Leesa. 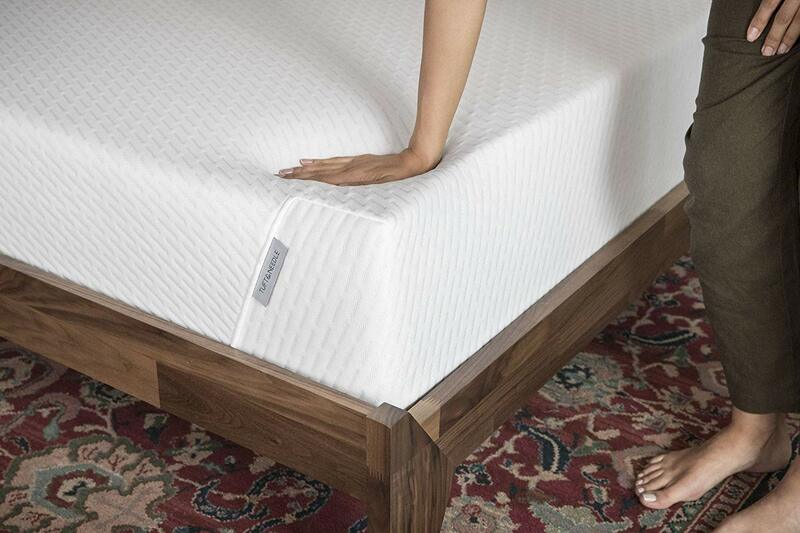 Like the Leesa, the edge support is just okay in the Tuft & Needle mattress. When you sit or lie near the edge some visible compression can be observed, but it is not enough to cause you to slide off. Also similar to the Leesa, Tuft & Needle makes a different model, called the Mint, which does more in the way of edge support. It has reinforced edges along the bottom side rails to help you feel more supported and allow for less compression. Both Leesa and Tuft & Needle rank very closely in this category. However, due to its firmer feel overall the T&N mattress comes on top this time. When foam mattresses first started coming into the market there were complaints of them sleeping too hot. Since then many changes have been made to help prevent overheating at night which can disrupt and cause you to get less restful sleep. Breathability and proper air circulation flowing through the mattress is the best way to combat overheating at night. If you are heavier or sleep with another person this is an important factor to consider because more heat is emitted into the mattress than would be with a small or single person. The same applies if you sleep on your stomach or back because more of your body’s surface area is directly applied to the mattress when you lie down. Unlike older foam mattresses, the Leesa does a great job of staying cool overnight by taking steps to actively regulate the temperature. The 2” thick top layer is made from their patented LSA200 Foam that was designed with cooling, airflow, and breathability in mind. The polyester blend cover also helps promote airflow throughout the entire mattress by being breathable and lightweight. The Tuft & Needle mattress does a superior job at sleeping cool, and it’s not by accident. The top layer made from their unique Adaptive foam is infused with a cooling gel and graphite which effectively wicks moisture and heat away from the skin. It’s density and open cell structure also allows for breathability. The cover only compliments this effect. It is a breathable micro polyamide and polyester blend which also helps to keep you cool all night long. Tuft & Needle wins in this category. Its special Adaptive foam does a slightly better job than the Leesa because it is infused with cooling gel and has advanced moisture wicking properties. Motion transfer isolation can be an added benefit for many sleepers. Light sleepers and people who sleep with their pets or young kids often find they get disturbed during the night if there is movement in bed. For some generally light sleepers, even shifting positions can cause a disruption, Compared to innerspring mattresses, foam mattresses do a much better job of eliminating motion felt across the entire bed’s surface. The Leesa mattress does a superior job at isolating and dissipating motion transfer. All three foams used in its construction contribute to this effect by working together. Of course, memory foam was designed by Nasa with shock absorption in mind, so it’s no surprise the Leesa excels in this category. Its dense structure absorbs any shock it experiences and quickly dissipates it before any disturbance occurs. If you place your Leesa mattress on a sturdy frame virtually all motion transfer is eliminated. The T&N mattress does an excellent job at eliminating motion transfer across the bed. Both of the foams used in its construction contribute to providing this effect. The top layer of Tuft & Needle Adaptive foam is able to absorb motion due to its open cell structure. Paired with a sturdy bed frame, this mattress has very minimal motion transfer. The Leesa mattress wins in this category as well. The added layer of memory foam makes its design surpass the Tuft & Needle mattress’ when it comes to the elimination of motion transfer. The Tuft and Needle bed still does a great job at isolating motion transfer and successfully dissipating it, just not quite as good of a job as the Leesa. The size options and price of a new mattress can play a large role in your decision, particularly if you are on a budget. Both companies have links on their site to a third-party which provides financing if you prefer to make monthly payments instead of purchasing forthright. These are the current prices in early 2019. Leesa frequently offers discounts and you can receive anywhere from $50 to $250 dollars off the total price depending on when you purchase. Make sure you look for deals if you decide Leesa is the bed for you. Tuft & Needle wins this round. On average, their mattresses are about $350 less expensive than Leesa’s. Considering they offer the same 10-year warranty, this is a huge benefit. If you are looking for a more affordable option, Tuft & Needle could be the right mattress choice for you. When it comes to comparing the Leesa mattress vs Tuft and Needle they have many differences, but they also have a lot of similarities. In the following sections, we will explore additional traits worth considering where both mattresses rank equally. Both the Leesa and Tuft & Needle have a 100 night in-home trial with a 10-year warranty. The in-home trial length and warranty indicate a company’s projected lifespan for their product. It lets you know how durable a product will be and also factors into the value equation. The longer you are able to use the product, the more affordable it becomes in the long run. Also, the in-home trial length allows you to purchase without being concerned you may not like it is as much as you hoped. With enough time to adequately try it out, you can be certain you made the right decision. Regardless of the in-home trial period, if you are still hesitant to purchase without trying first both of these mattresses can be found in brick and mortar stores across the country. The Leesa mattress can be found in approximately 100 West Elm locations. Tuft & Needle has its own stores open in Scottsdale and Gilbert Arizona, Seattle Washington, Kansas City Kansas, and soon in Raleigh North Carolina. Both the Leesa and the T&N mattress are compatible with adjustable bed frames. Leesa also makes their own adjustable bed frame available at an additional cost. Kown as the Leesa Adjustable Base, it has a minimalist look and it is manually adjusted. The legs are black metal and the adjustable base is comprised of three bendable panels which are grey in color. The design allows for many varying configurations that can easily be adjusted to suit your needs at any time. Depending on the size you require it could cost anywhere from $875 to $1045. Both the Leesa and Tuft & Needle mattress are 10” thick. For many people, this will not affect the decision-making process. However, if you have small children, limited mobility, or pets that will be sharing the bed with you the thickness is important. A thinner bed, paired with a low profile bed frame allows easier access. Free shipping and returns are included in the price of both the Tuft & Needle and the Leesa mattress. They arrive tightly compressed and can be unboxed, and ready to use quickly. Leesa also offers White Glove Delivery for an additional fee of $100. This service provides you with a team who will deliver your new mattress, bring it to the room of your choice, and set it up with a bed frame. For another $50 on top of that, they will also remove your old mattress and box spring which will save you from arranging pickup yourself. This may or may not be considered a perk by you depending on your own personal preferences. 5. Where is it made? Both Tuft & Needle and Leesa mattresses are designed and manufactured within the USA. They comply with national safety and health guidelines and only use CertiPUR-US certified materials. Choosing to buy American made denotes a high level of quality in the product while also ensuring a quicker delivery to the consumer. Ordering American products also reduces your carbon footprint which is good for the environment. Both of these mattresses comply with national flame retardant requirements. They will not contribute to, or spread a fire in the case of an emergency. 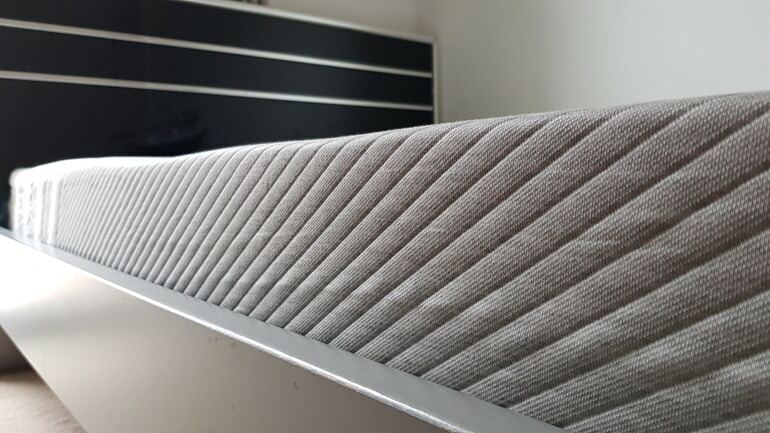 Both mattresses use a blend of polyester fabrics in the cover, which is inherently flame retardant, to achieve the desired results without the use of possibly toxic chemical treatments. This all-natural solution promotes healthy lung function by giving you fresh, clean air to breathe as it filters through the bed overnight. Tuft & Needle also treats their fabric with food grade salt to enhance the flame resistant potential. Now that we’ve covered all the aspects of the comparison, let’s quickly review so you can make a decision. Bounce: This mattress provides more bounce than a traditional foam bed because it includes polyfoam in its construction. A firmer feel: It is slightly firmer than the Leesa and as a result, may also be preferred by large or heavy people. Affordability: The T&N is considerably less expensive than its competitors and is a great option for anyone on a strict budget. Contour: The mixture of foams used to build each Leesa mattress adapts and contours to your body providing you with support and comfort. Pressure point relief: The LSA200 foam provides superior targeted pressure point relief which promotes healthy spinal alignment and relief from extreme pressure caused by sleeping in certain positions while you sleep. Motion transfer isolation: The Leesa excels in this category and any motion transfer experienced is very minimal. Medium firmness: This mattress has a universal comfort level that is not too firm, and not too soft while still being supportive enough to accommodate any sleep position you choose. Hopefully, this article has helped you to sift through all of the available information in a way that makes you feel confident in your decision on which mattress best suits your needs. If you need more comparisons, please check our latest Leesa vs Purple review.